This is a repost from 2014. Nothing has changed. There is a different set of rules between right and wrong than there is in the free world. My focus has been the injustice that has been shown to Jamie, and to all other prisoners as well. It’s about the injustice shown when he was a teenager, locked up for nine months that became 4 years. They finally had to let him go because he turned 21 and they couldn’t hold him any longer. It is also about the injustice shown him when he was picked up for the charge of ‘aggravated assault’ because he was with someone who decided to use his gun to rob a place and he tried to run away, and the injustice of never having any justice at all because his woefully inadequate public defender, who is in the pocket of the district attorney knew it was his job to scare him to death so he would take a plea of 17 years insteadof going to court and possibly getting up to 99 years. What would you do if you were faced with that? You’d probably take the plea, too. The years spent in solitary confinement, being treated as a subhuman being not deserving of human rights, is now hoping against hope that nothing will stop him from being allowed to make his very first phone call to his son since the day he was born. That is a lot of injustices, isn’t it? That has been my focus of this post. There is another side of the story. The prison system is genuinely, very corrupt, filled with people and corporations looking to make a buck any way they can, even if it means hurting people. The security guards are to blame for the inhumane way they treat inmates. They are allowed to do this. The prison officers look the other way. The prison industrial complex sets the tone for this while taking advantage of prisoners. The security guards aren’t the ones who line the pockets of the government agencies and politicians so that the vote goes for the corporations and against the people. Corporations have been getting their way for a long time and there hasn’t been a whole lot anyone has been able to do to stop it. Money goes a long way in keeping information about their abuses from getting into the wrong hands and used against them, but even if it does and they have to pay off the lawsuits, they still made more money off the backs of the people than what it costs them to pay up, so I guess it’s worth it to them. I could go into a long tirade against the corporations that cheat the inmates by not providing the care they so proudly proclaim they do on their websites, cheat the government and cheat people out of years of their lives all for the sake of a buck, but that isn’t my focus today. I want to focus on the prison guard himself. What kind of man or woman becomes a prison guard and what kind of nature does a person have to have that allows him to justify his actions and tell himself that what he/she is doing is ok? The prison says it’s ok if they torture inmates, so why not? But how do they live with themselves when they have participated in inhumane treatment of human beings? How can they do it and go home to their friends and family and tell them about their day? Who were they when they started and who did they become? Was that nature there all along and all it needed was a shove in the right direction? But still. I know that not everyone who works in a prison is like this. There have to be some good people who work there, too. There are some careers where you have to turn off your emotions. If you are affected by the environment you work in, it could take you into a very dark place. If you got too involved, how could you turn it off at the end of the day? Is being a prison guard a role you play that gets put into the locker at the end of the day the way an exotic dancer puts her costumes in her suitcase and walks out the door at the end of a shift? 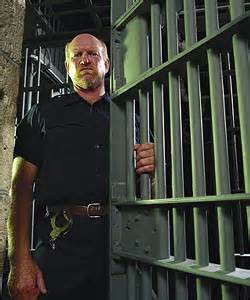 Is a prison guard always a prison guard? When does it become an identity instead of a job? Another profession that abuses the right to hurt people are the very people who are supposed to protect and serve the people of our communities. We know who they are. We read the news. We watch it on TV. We aren’t surprised any more when we hear of one more case where the bounds of the law were stepped over and another person was needlessly taken advantage of, hurt or killed. We would be shocked if it all stopped and the law was actually used to help us instead of control us. The days of Andy of Mayberry are long over. The government has insisted that we don’t torture inmates. How can they say that and who believes them? On Nov. 12 and 13, the practice of holding incarcerated people in prolonged isolation will come under international scrutiny when the U.S. government goes before the United Nations Committee Against Torture in Geneva. It’s part of a periodic review to assess if this country has been compliant concerning the guidelines of the Convention Against Torture and the first U.S. review under Obama’s administration. I think we know the answer to that. But I think anything said will just be lip service and they will continue to do things exactly the way they have been doing it. But I’m getting off the subject. I want to find out who the people are who actually enforce the rules of behavior that says it’s ok to treat people so badly that they sometimes die from the abuse. What kind of prison guard can stand by and watch that happen? Apparently quite a few.